There’s been enough bad news about South Africa’s state-owned electricity company in recent months to rattle the hardiest bond investor. Or so you’d think. Even before President Cyril Ramaphosa said on Tuesday the nation won’t allow Eskom Holdings SOC Ltd. to fail, the company’s bonds were trading as if its troubles were over. The premium investors demand to hold the company’s 10-year dollar bonds rather than U.S. Treasuries dropped this week to the lowest since the securities were issued in August. 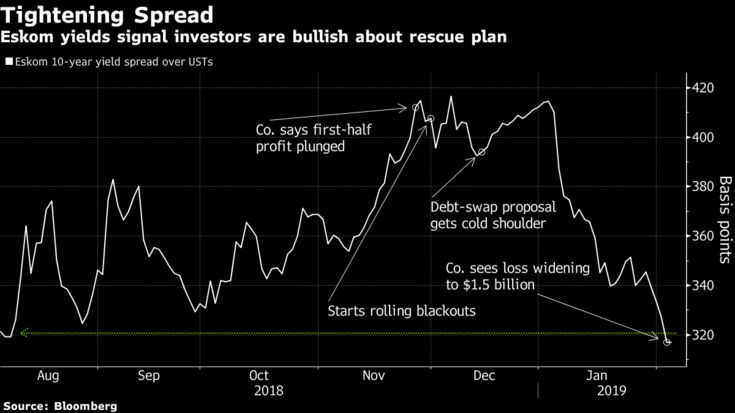 That suggests traders were bullish about a much-anticipated rescue plan for the utility, deemed “too big to fail” by the World Bank. Ramaphosa, who previously poured cold water on Eskom’s proposal that the government take over some of its debt, said the country will announce a package of measures to fix the company. He might reveal the outlines of this strategy in his state-of-the-nation speech on Thursday. Eskom said on Monday it expects a loss of around 20 billion rand ($1.5 billion) for the year through March as coal and maintenance costs increased. It has about 419 billion rand of debt, of which 260 billion rand is guaranteed by the government, a potential liability cited by rating companies as a credit negative for the sovereign. With a cash injection, Eskom would cover its funding gap for the next three years without needing further government guarantees, the BoAML analysts said. The company said last week it secured about 95 percent of its 72 billion-rand funding needs for this year, and 30 percent of next year’s requirement. Eskom’s 10-year dollar spread over U.S. Treasuries was little changed at 317 basis points on Tuesday, even after Ramaphosa’s statement. The premium has narrowed almost 100 basis points since the beginning of January.